Cleaning your teeth and your mouth regularly is the best way to reduce your risk for cavities, gum disease, and bad breath. At the very least, you should brush your teeth twice a day and floss once a day. First, you should use a soft toothbrush when cleaning your teeth. If you are accustomed to using a hard brush you may feel that a soft toothbrush just doesn’t get the job done. The soft brushes are very effective. 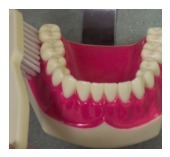 Hard brushes on the other hand are just way too hard; they can be very damaging to the gums around your teeth. Save them for cleaning the grout in your shower. Once you have your brush, place a small drop of toothpaste on your toothbrush, an amount about the size of a pea. I know that the toothpaste commercials always show a huge worm of paste on the brushes, but you just don’t need that much. You may hear differing opinions on whether the brush should be wet or dry. I wouldn’t worry about it; just do whichever you prefer. No studies have shown a significant difference between a wet or dry brush. 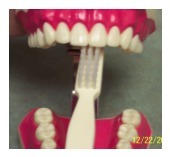 Place the brush so that the bristles are at a 45 degree angle aimed at the gums. 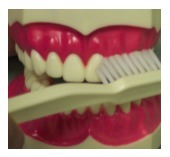 Begin by holding the bristles at a 45 degree angle to the gums on the front smiling surface of the teeth and move the brush in small circles. It’s best if you start on one side and slowly move all the way across to the other side so that you don’t forget where you’ve been. Do the same motion on the back sides of the teeth. 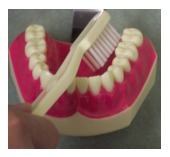 You can scrub the chewing surfaces of the teeth in a back and forth motion. It should take you a solid two minutes to brush your teeth effectively. Set your stopwatch or a timer to know you’ve spent the right amount of time. You could also watch this 2 minute video for entertainment, because if you are not used to it, two minutes feels like a long time.